UW-Madison has a spectacular shoreline along Lake Mendota. Including Picnic Point (seen in the background in this photo), there is over 4 miles of lake frontage. 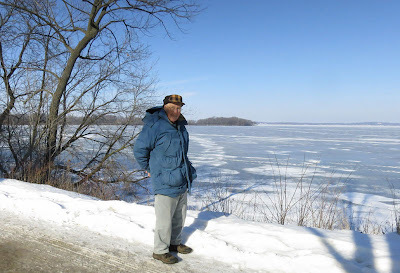 Yesterday the weather cooperated and Kathie and I walked from Picnic Point to the Memorial Union. Among other things, we walked past Willow Creek Woods, which has recently been converted into a nice restored oak savanna. Some of the largest bur oaks in the area are present just a stone's throw from the lake. (According to the Lakeshore Preserve web site, there are 23 large oaks in Willow Creek Woods.) For many years, this savanna had been hidden behind a dense undergrowth of invasive shrubs, which blissfully are all gone. Although this is the wrong time of year to see herbaceous plants, we did see some strands of savanna grasses. Also, there were lots of small blue flags scattered around, places where (we assume) plugs had been planted last fall. 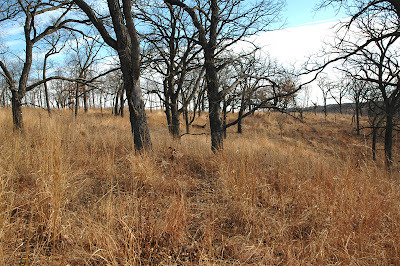 This savanna has another feature, a large Native American burial mound. The campus is studded with such mounds, from Eagle Heights to Observatory Hill. These mounds, often in the shape of animals, were built by Middle to Late Woodland peoples, and date from 0 to 1200 A.D. Although these peoples are long-gone, their heritage lives on in these effigy mounds. (Azitlan, near Lake Mills, was built by Late Woodland people as was the great city of Cahokia, in Illinois.) Archeological work has shown that the Willow Creek site was once an ancient workshop or village. There has been quite a bit of research on the mounds of Madison, going back to Charles E. Brown's work in the early 20th century. A nice summary can be found in a publication of the Wisconsin Historical Society, which can be found at this link. These mounds are topped by a few of the largest oaks. As Kathie and I neared the Union, we were entertained by someone speeding across the lake with a skate sail. There was too much snow for skates, so he was using skis. In the Union we enjoyed some hot tea and coffee from Peet's, a long-time Berkeley company that seems to have found its way to Madison. Finally, we took the campus bus back to where we had started our walk. Since it was class change time, the bus was jammed, so we became strap-hangers. Nice afternoon. The lack of snow this winter got me thinking about how variable our precipitation is in southern Wisconsin. I obtained from the State Climatology office data for our area that permitted me to study this variability in some detail. I'd be happy to send the big Excel file to anyone who is interested. For this post, I am using the month-by-month annual averages, and the maximums and minimums for each month. As the graph shows, there is marked year to year variability. The 17-year average of 35 inches rarely happens, and the range is from a low of 24 inches (in 2005) to a high of 44 inches (in 1998). 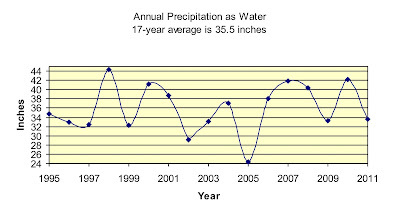 The years 2001 through 2005 constitute a dry period, and the years 2006-2010 a wet period. However, if you look at the monthly data, you find that some years there may be a single month with a very high or very low total. For instance, even though everyone remembers the huge rainstorms of June of 2008, this was not the extreme high, which was May 2004, even though the rest of 2004 was fairly dry. The table below gives average data for each month, with both the maximum and minimum for that month, and the year that extreme occurred. If you look at how the annual precipitation is spread out monthly, Wisconsin can be divided into three separate periods. The period of lowest precipitation is winter, Dec/Jan/Feb/and part of Mar, with about 18% of the total. The months of Apr through Aug constitute the bulk of the precipitation, 61%, and Sep Oct and Nov about 21%. When you consider this breakdown in relation to temperature, it turns out that the months with the highest temperatures are also the months with the most precipitation. This, of course, is our growing season. However, other parts of the United States are quite different. Most of California get almost no rain during the hot summer, but lots during the winter, when temperatures are lowest, which explains why California agriculture is based primarily on irrigation. Although these monthly figures are useful, it should be remembered that there have been months when the data have been much different. Take a look at the max and min values below. 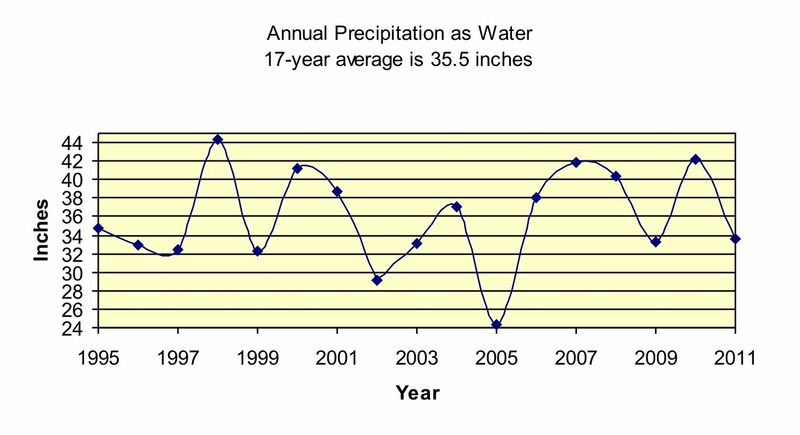 As the table show, although June of 2010 was very wet, in 1995 June was very dry. 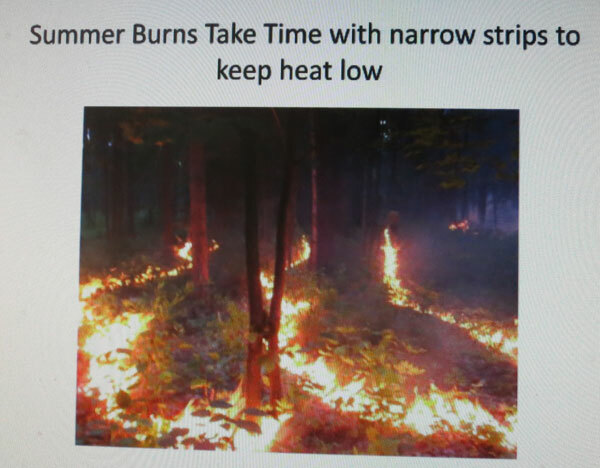 In fact, there have been summer periods as long as 4 weeks when it did not rain at all. 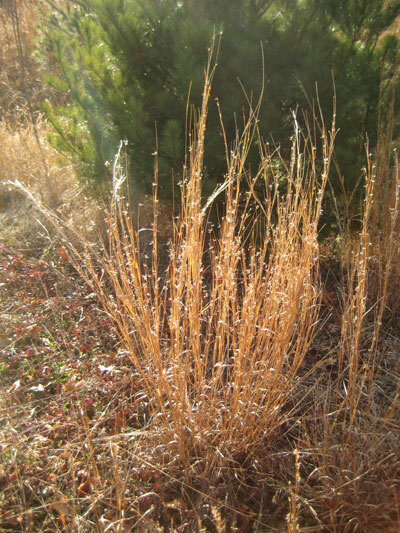 In a discussion of Indian grass and little bluestem in an earlier post, I discussed our observations that the former grass is favored by wet summers and the latter by dry summers. During that dry period centered on 2005, the large Indian grass stand in the prairie remnant called Unit 4 was virtually replaced by little bluestem. In the wet period that we have had since 2007 the reverse is the case, and Indian grass is now dominant, as it is on major parts of the south-facing slope. These precipitation data obviously have phenological implications. On a recent trip to Massachusetts I discovered that little bluestem (Schizachyrium scoparium) is quite common in their coastal areas. This was one of the most frequent roadside plants I saw (and I even saw a piece of roadside where it had been burned). Coastal Massachusetts is quite sandy. In addition, there are lots of retired cranberry bogs where little bluestem has become well established. The photo above is a typical example. These retired cranberry bogs are interesting, in that little bluestem seems to become established without any effort on the part of restorationists. Part of the standard agricultural practice here is to put down a layer of sand on top of the cranberries every three or four years. The crop grows up through the sand and sends out upright stems that flower and make fruits. By the time the production bogs are retired, there has been quite a bit of sand buildup. When the retired cranberry production bog is drained, plants are just allowed to recolonize. In the photo above the bog on the left had been retired quite a few years earlier. 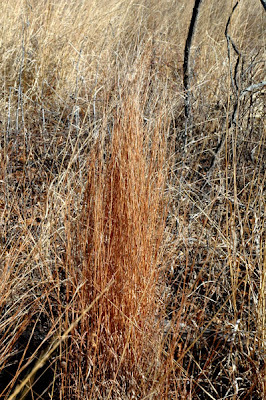 In this area little bluestem grows in typical cespitose fashion, as the photo here shows. I knew from the USDA Plant Database that little bluestem could be found in almost all the 48 states, but I was not aware that it did so well on the east coast. 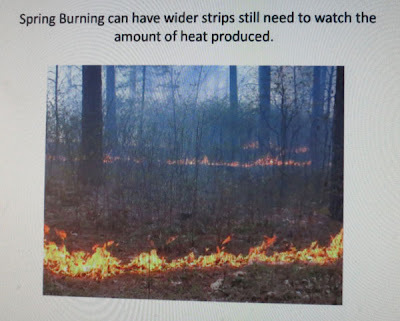 In fact, restoration work in areas of coastal Massachusetts, such as Cape Cod, little bluestem is one of the species used in reseeding, then followed by prescribed burns. They don't seem to call these grassy areas "prairies". The federal publication "Roadside Use of Native Plants" provides a species list for each state, and little bluestem is listed in every state except California, Oregon, Washington, and Nevada. Very few other species have such wide capabilities. 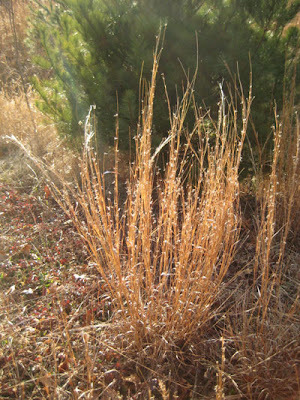 Of course, little bluestem can only compete well in relatively dry areas. In favorable soil with plentiful moisture, it gets out competed by other grasses or forbs. 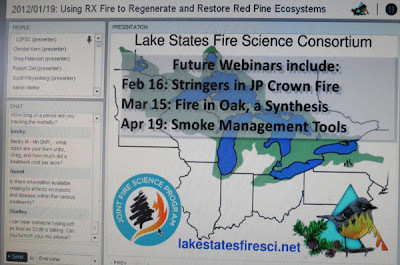 Just Posted: 2012 Summer internship opportunities in ecological restoration! Pleasant Valley Conservancy has just posted job openings for two (2) internships in ecological restoration for the summer of 2012. 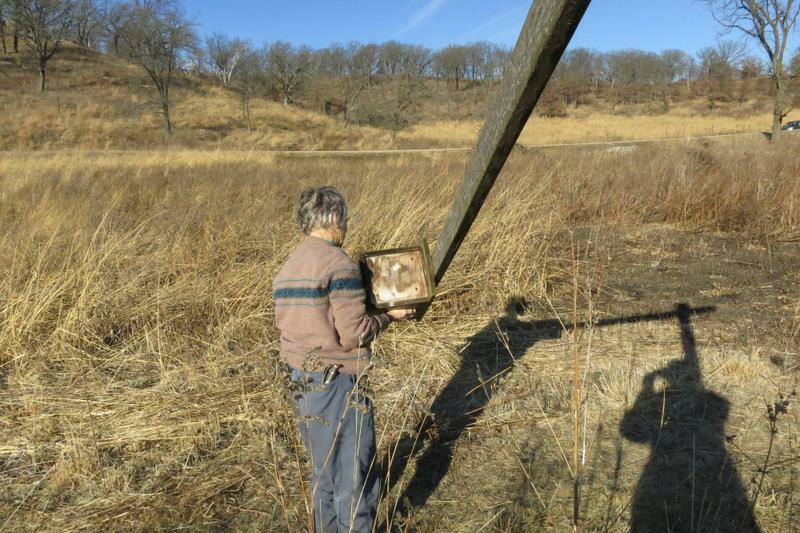 Excellent opportunity to work with experienced crews doing prairie and oak savanna restoration. Internship also involves some work at Black Earth Rettenmund Prairie. 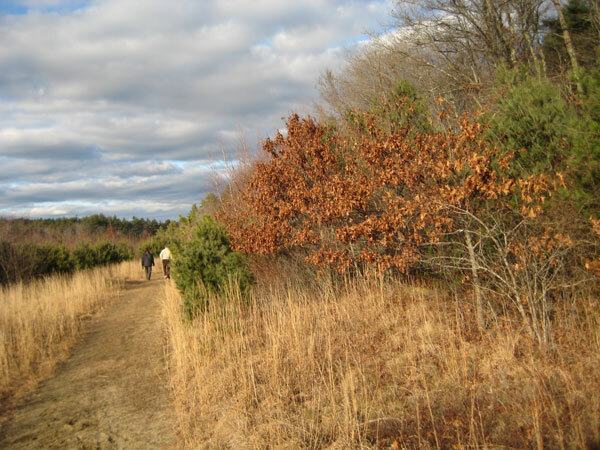 Both of these sites are State Natural Areas with high species diversity. Kathie and I took advantage of yesterday's fantastic weather to finish cleaning out our birdhouses, getting ready for the 2012 crop. 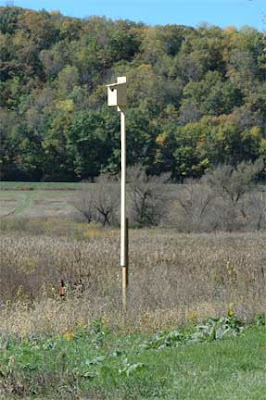 Kathie had cleaned out her bluebird houses on a good-weather day in late December. 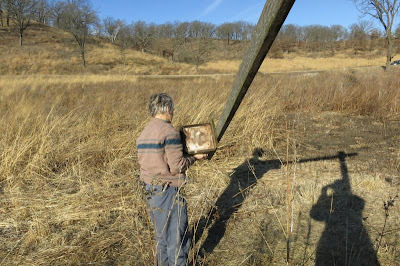 Yesterday was an even better day, and we cleaned out the two kestrel houses and the wood duck house. Cleaning involves removing all last year's wood chips and bird debris, and putting in some fresh wood chips. We have two kestrel houses, but only one is being used. We have had fledglings in the one house every year since we first installed them in 2008. 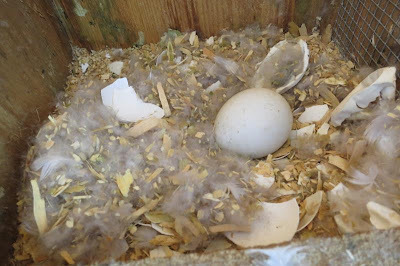 We have seen kestrels around the second house but so far no success with nesting. The wood duck house is much closer to the ground, but near the boardwalk that permits access to the wetland. This house has been up for two season's now, but instead of a wood duck we have been getting a hooded merganser. Birders tell us that the merganser is a lot rarer than a wood duck, so we should be happy. When we opened the wood duck house this year we found one whole unhatched egg, plus the remains of at least one additional egg which may have represented a fledged merganser. Yesterday Kathie, Susan, and I did the annual Audubon Christmas bird count at Pleasant Valley Conservancy. This is the 112th annual Christmas bird count run by the National Audubon Society, which this year ran from December 14, 2011 through January 5, 2012. The count in our area was held on January 1 (New Year's Day). This is about the 10th year that the count has been held at Pleasant Valley Conservancy. Every year the weather is different. One year the roads were sheets of ice, another year there was a foot of snow. This year there was no snow at all and we could drive up to the top of our service road with no difficulty. However, there was a heavy wind (around 25 mph from WNW), so we did the whole count from our car. It really worked well. I drove and Kathie and Susan counted the birds. We were able to creep along with the windows open, the heater on, and the engine close to idle. After climbing to the top, we started at the East Basin and drove slowly all the way to the west end of the ridge along the service road. Then we took the side road to the Rocky Overlook. Finally, we drove slowly along the whole length of Pleasant Valley Road. We spent about 2 hours counting birds. Because of the strong wind, most of the birds were hunkered down, so our count was pretty low. However, we did see a bald eagle, a red-headed woodpecker, two hairy woodpeckers, a tufted titmouse, a nuthatch, some chickadees, a large "vee" of Canada geese, and 11 turkeys, plus the usual collection of crows and junkos. The bird count is organized by "circles", each centered on a city. There are 15 circles in Wisconsin, and anyone can participate. See this link for details.